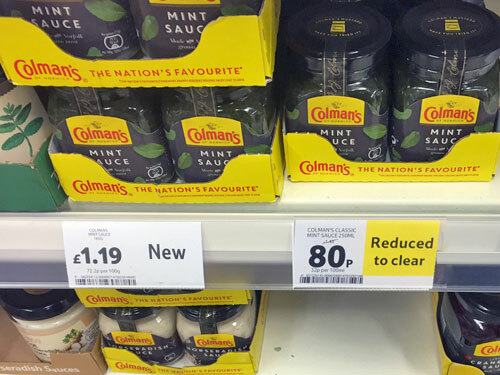 Last week I was very pleased to see my usual jar of mint sauce on special offer in the supermarket. It cost 80p rather than the normal £1.45. I was much less pleased to see a label on the shelf saying "Reduced to clear", so I grabbed the last two jars. This week I was very pleased to see the same brand of mint sauce back on sale in the supermarket, and for 26p less than a jar used to cost. I was much less pleased when I noticed the mint sauce was in a smaller jar. So I did some sums. The original sized jar cost £1.45 for 250ml. That's 58p per 100ml. The new smaller jar costs £1.19 for 165ml. That's 72p per 100ml. That's a 24% price increase, disguised as a 26p price cut. That's market forcesbig businessthe tumbling poundBrexit Britain for you.